Narputta Nangala's 'Karrkuntinytja', 1999, is essentially a landscape painting of the countryside surrounding her birthplace (Karrkuntinytja). Narputta is a senior artist and custodian for her community at Ikuntji (Haasts Bluff) and one of the most prominent of the Ikuntji Women's Centre painters. Narputta is the wife of Timmy Tjungurrayi Jugadai who painted for Papunya Tula in the 1970s and 80s. Narputta began painting in her own right in 1992. "My country is Lampintja, kurrkati (goanna) tjukurrpa and my father's country is karrkuruntinytja, kuniya kutjarra (two carpet snakes, two brothers, two Tjangalas) tjukurrpa. This country also belongs to my grandparents. I was born at Karrkurutinytja, beside the lake. My father's name was Taluku Tjampitjimpa. My brothers were Tiwil Tjangala and Mulgilnga Tjangala. My grandmother's name was Mantuwa Nungarrayi and my grandfather Tiwil Tjangala." 'Karrkuntinytja' is an amazing painting that shows Narputt's unique vision of her country. There seems to be a vastness, a rich hinterland, well treed and watered. The white horizontal void dividing the painting jolts the eye back to the line of hills bordering the top and bottom of the painting. Lakes or waterholes and what could be salt pans are the dominant elements covering the field. 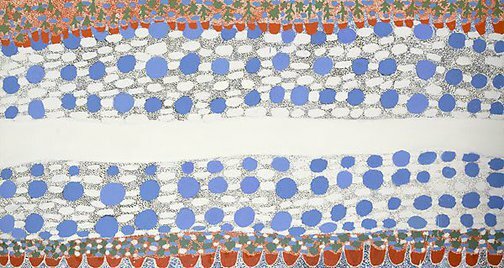 Narputta was the winner of the 'Open Painting' section of the 1997 Telstra National Aboriginal Art Award and is represented in the collections of the National Gallery of Victoria, the National Gallery of Australia, the Groninger Museum, The Netherlands, Supreme Court, Darwin among others.